First class bank building on high traffic corner. Building features a large lobby area complete with cathedral ceilings and skylights, six station tellers’ area, five private offices, two conference rooms, employee lounge, two ADA restrooms and vault. Outside there is a five-lane drive-thru, extensive professional landscaping, ample parking and two freestanding signs one with LED displays. For financial institutions this is an opportunity to quickly and reasonably expand or establish a presence in the Monroe County market. As of June 30, 2014, this branch had more than $21,500,000* in deposits. 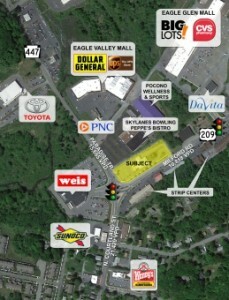 Excellent opportunity to acquire a quality building in a prime location.